During the journey of our professional lives, most of us reach some critical career junction feeling as though we have no idea how to travel. In a compelling new approach to career healing, Dr. Yanai demonstrates that getting stuck in one’s career is not only normal but also signals a vital turning point. Getting stuck is often a sign for successful completion of one developmental stage and the need to workout muscles for the next one. In her book, Dr. Yanai portrays that as frightening as impasse can be, beneath the surface, each of us is like a river: deep down, we know where we want to flow. 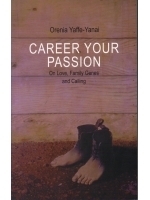 Drawing on in-depth research on her own impasse and career saga as daughter, sister, psychotherapist, and vocational counselor to hundreds of clients, Dr. Yanai escorts readers on a journey of their own professional dramas connecting them to their vocational heritage their career DNA, removing obstacles such as fears, parents professional failures and dreams , false beliefs and expectations. A journey towards identifying their own authentic dreams and towards finding a career filled with passion. - Dr. Ichak Adizes , Voted one of top ten leading consultants in U.S.A.